How freq uently should skates be sharpened? 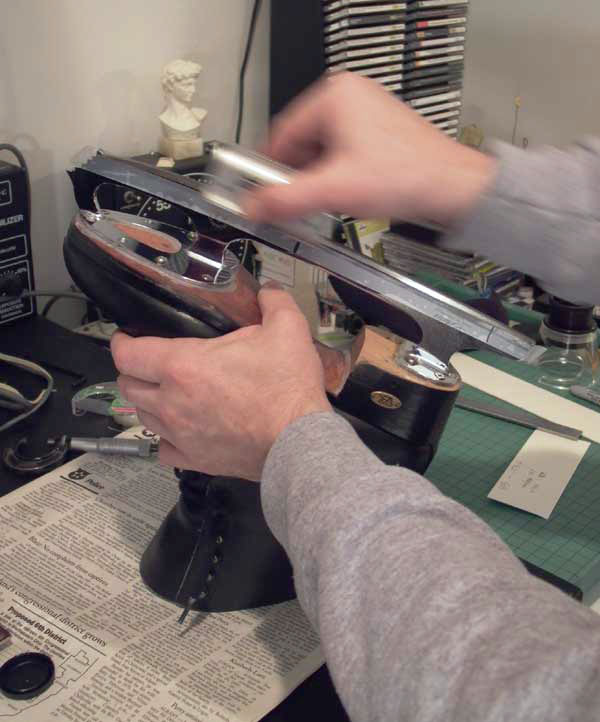 Typical sharpening for figure skates frequently range from every 5 weeks for a daily skater to every nine months for a once-a-week skater. In general, ice skates need sharpening about every 100 hours of skating as long as care is taken to avoid damage from stepping on metal, concrete or any other hard or abrasive material. Pond ice may contain dirt and stones. One accidental step on concrete will probably ruin the last sharpening. Hard guards and soakers can be used to protect the blades while walking to and from the ice and when the skates are carried in a bag. Always dry off the blades after skating to prevent rusting and make sure the hard guards are also dry if they are going back on the blades. Skates need sharpening when they start to slide sideways too easily. An experienced skater can often tell when the skates are getting dull but beginners can’t, so look for feet skidding sideways when pushing or doing crossovers. What do I need to know about getting ice skates sharpened? The first thing to find out is where. The right place in your area might be the rink, a skate shop or a sharpening specialist. The simplest approach is to ask several more advanced skaters where they go. At a minimum you should make sure that you can get a correct hollow radius and level edges. If the sharpener doesn’t know what a hollow radius is or have a square to check the levelness of the edges after sharpening, it might be better to go some place else. The grinding stone is dressed to a circular shape to make a hollow along the bottom of the blade. The hollow radius usually ranges from 3/8″ (deeper) to 3/4″ (shallower). Beginners usually prefer a 5/8 or 3/4″ hollow. Advanced skaters usually use a 3/8 to 1/2″ hollow. Can I tell if my skates have been sharpened correctly by looking at the blades? You can compare the radius of the hollow with the edge of a penny. If the penny fits exactly, the radius is 3/8″. If it can roll back and forth a bit, the radius is greater than 3/8″. If it touches at both sides but doesn’t reach the bottom, it is less than 3/8″ and a beginner will have a lot of trouble stopping. You can also check the levelness by balancing a pen or pencil across the blade. If the pen slopes toward either side, the edges are not level. Two other easy things to check are to make sure the bottom of the blade curves smoothly from front to back with no sub-curves and that the bottom toe pick hasn’t been ground off. Both of these problems will make the blade virtually useless for edges, spins and jumps.